Below you fill find all funeral homes and cemeteries in or near Limon. Suburbs of Limon: Limon Correctional Fac, Limon Correctional Facility, Limon Crrctnl. Limon is also known as: Lincoln County / Limon town. Their current mayor is Mayor Dave Stone. Zip codes in the city: 80826, 80828. The Town of Limon is the Statutory Town that is the most populous municipality in Lincoln County, Colorado, United States. 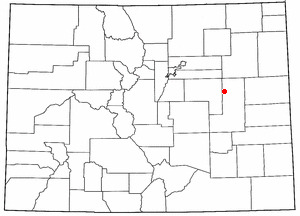 Limon is located immediately east of Elbert County. The population was 1880 at the 2010 United States Census. Limon has been called the "Hub City" of Eastern Colorado because Interstate 70, U.S. Highways 24, 40, and 287, and State Highways 71 and 86 all pass through the town. The Limon Correctional Facility is part of the Colorado Department of Corrections system and is a major employer in the area with employment of roughly 350. Limon is listed as the official AASHTO control city for signs on Interstate 70 between Denver and Hays, Kansas, although westbound signs in both Colorado and Kansas often omit Limon and list the larger city of Denver.Limon is the western terminus of the Kyle Railroad and it is here the shortline interchanges with the Union Pacific Railroad. Trains previously stopped at Limon Railroad Depot. It was written on July 23rd, 2018 that Myldred R "Milly" Perrine (Gothberg) died in Spirit Lake, Idaho. Ms. Perrine was 94 years old and was born in Limon, CO. Send flowers to share your condolences and honor Myldred R "Milly"'s life. It was revealed by Klamath Falls Herald and News on May 13th, 2018 that John D Dr "J D" Bell passed away in Lake Oswego, Oregon. Bell was 86 years old and was born in Limon, CO. Send flowers to express your sympathy and honor John D Dr "J D"'s life. It was disclosed by Hastings Tribune on March 24th, 2018 that Lois Arlene Johnson (Burns) passed away in Hastings, Nebraska. Ms. Johnson was 93 years old and was born in Limon, CO. Send flowers to express your sympathy and honor Lois Arlene's life. It was reported by The Mail Tribune on January 28th, 2018 that LeRoy F Chartier died in Oregon. Chartier was 79 years old and was born in Limon, CO. Send flowers to express your sorrow and honor LeRoy F's life. It was noted on January 28th, 2017 that Henry Abram "H A" Ratzlaff passed away in Limon, Colorado. Ratzlaff was 80 years old and was born in Ford Co, KS. Send flowers to express your sympathy and honor Henry Abram "H A"'s life. It was noted by Albany Democrat-Herald on November 2nd, 2013 that Donald Edward "Don" Hurley passed away in Corvallis, Oregon. Hurley was 70 years old and was born in Limon, CO. Send flowers to express your sympathy and honor Donald Edward "Don"'s life. It was reported by Arizona Republic on September 22nd, 2012 that William Thomas Garner perished in Arizona. Garner was 89 years old and was born in Limon, CO. Send flowers to share your condolences and honor William Thomas's life. It was reported on April 22nd, 2012 that Jesus David "Chu" Nuno perished in Limon, Colorado. Nuno was 48 years old. Send flowers to share your condolences and honor Jesus David "Chu"'s life. It was revealed on March 31st, 2012 that Fred Edwin Palmer died in Sun Lakes, Arizona. Palmer was 76 years old and was born in Limon, CO. Send flowers to share your condolences and honor Fred Edwin's life. It was revealed on March 31st, 2012 that Fred Edwin Palmer passed away in Sun Lakes, Arizona. Palmer was 76 years old and was born in Limon, CO. Send flowers to express your sorrow and honor Fred Edwin's life. Limon is a Colorado municipalities#Statutory_Town Town that is the most populous town in Lincoln County, Colorado County, Colorado, United States immediately east of Elbert County, Colorado County. Limon has been called the "Hub City" of Eastern Colorado because Interstate 70 (Colorado) 70, US Highways US Highway 24 (Colorado) US Highway 40 (Colorado) and US Highway 287 (Colorado) and State Highways Colorado State Highway 71 and Colorado State Highway 86 all pass through the town. The population was 2,071 at the United States Census, 2000 census. The Limon Correctional Facility, Colorado Correctional Facility is part of the Colorado Department of Corrections system and is a major employer in the area with employment of roughly 350. . The official website for the city of Limon is https://www.townoflimon.com/. Visitation will be today from 1 p.m. to 8 p.m., at Ladbury Funeral Service, Dickinson ... Panama Canal Zone, North Dakota and Colorado. Frank graduated from Simla High School in Simla, Colo., in 1990. He entered the United States Air Force. Listing all funeral homes in Limon, Colorado so you can easily send flowers to any location (same day delivery) or find any funeral service. We work with local florists and flower shops to offer same day delivery. You will find budget sympathy flowers in Limon here. Our funeral flowers are cheap in price but not in value.